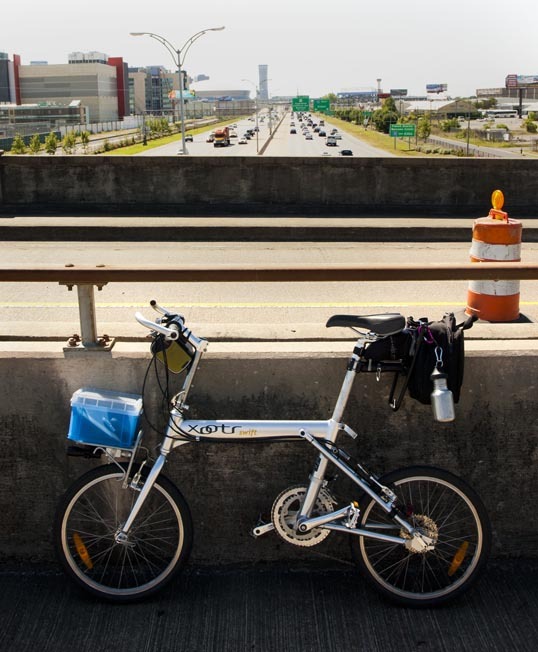 My Xootr Swift folding bike on the bike route over Interstate 10 in New Orleans. Downtown and the Superdome are in the background. We had a trip to New Orleans planned for Tulane Graduation. Lee actually graduated in December, and didn’t plan on walking, but we wanted to go anyway… sort of a closure. This was the first out of town trip that we had taken since I had bought my folding Xootr Swift bike. One of the reasons I wanted the folder was to be able to take it along, collapsed in the trunk, and pull it out for a ride whenever the opportunity presented itself. Lee’s friends had arranged a party for the graduates and parents at Parkway Bakery and Tavern. 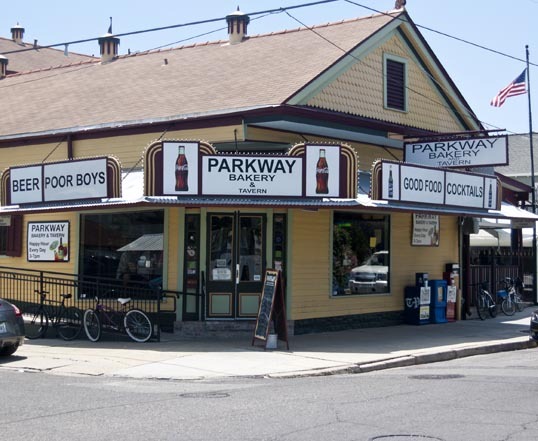 A few years ago I had seen a television show that claimed Parkway had the best Shrimp Po’ Boy sandwiches in New Orleans. That’s a pretty salty claim – but I have eaten there before and can’t really argue (though Domilise’s is close). No way am I going to miss a meal at Parkway, and I wanted to ride my bike. As early as I could rustle my rusty bones out of our guesthouse in the Garden District I walked to the car, unfolded my Xootr from the trunk, and set out across the city. I had no real idea of a where I was going, but used my phone and the Bicycle Route little green lines on Google Maps and was able to find my way. One good thing is the way the Crescent City is laid out, as confusing as it can be, all the roads seem to run to Parkway’s ‘hood. I have been going to New Orleans for decades, and I think this was the first day of really, really nice weather I’ve ever seen. I had ridden my commuter bike around Tulane in December, but the wind was howling cold spitting rain. New Orleans has been working hard on making its streets more bike friendly and they have succeeded. There are bike lanes and recommended streets. There aren’t a lot of dedicated trails, except in a few key choke points – like crossing Interstate 10. There is no comparison to Dallas (which is well known as the worst city for cycling). First, let’s face it, the city of New Orleans itself isn’t really very big – it’s only four miles or so from the river to Lake Pontchartrain – as opposed to the hundred miles from Mesquite to Benbrook. New Orleans is hell to drive in – which, ironically, makes it easy to ride a bike in. The streets are narrow and choked which slows and “calms” the traffic. I could ride across town as fast as I can drive. In Dallas it’s not unusual to come across cars going a mile a minute – which is rolling death if you aren’t wrapped in a steel carapace. The one downside to riding there are the cracked pavement and the potholes. I had to keep my eyes open and those tiny wheels on the folder transmit every shock right to my spine. I learned quickly to stay off the side streets and use the lanes on the larger thoroughfares – the pavement had been better repaired. But, other than that – it was a blast. I became lost less often than I had predicted (only once) and arrived at Parkway an hour early. That gave me time for a quick ride around City Park and along the shore of Lake Pontchartrain. City Park is beautiful and huge (though people tell me it is a shadow of its pre-Katrina glory) and Pontchartrain feels like an ocean shore. My Xootr Swift along the shore Lake Pontchartrain, New Orlean, Louisiana. 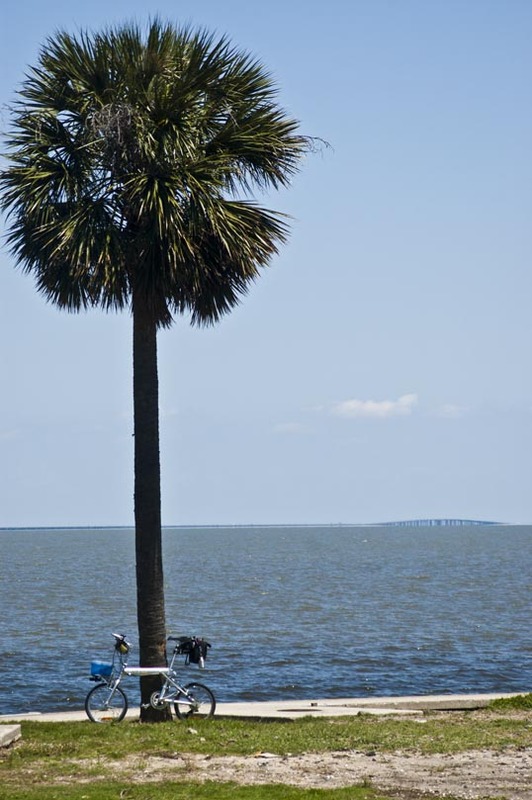 You can see the Pontchartrain causeway on the horizon. I didn’t have time to waste so I kept pedaling and still made it to Parkway before the festivities. I locked the bike out front until Candy and Lee arrived in the car – then all I had to do was fold it back up into the trunk. Another advantage of the ride – that Shrimp Po’-Boy sure tasted extra good. This entry was posted in Bicycling and tagged bicycle, cycling, folding bike, louisiana, New Orleans, Photography, tulane, xootr. Bookmark the permalink.